Statistics is a subject that is perhaps best done in small doses. These papers are designed to put a specific topic across in a succinct way. They are long enough to put the main points across and short enough to be revisited by researchers as and when they need to. 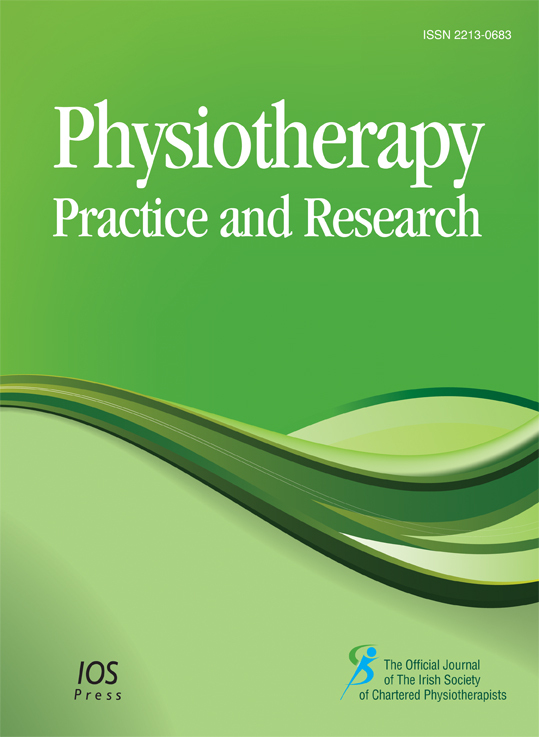 Physiotherapy Practice and Research is the Official Journal of The Irish Society of Chartered Physiotherapists. It is an international, peer-reviewed journal which aims to advance physiotherapy practice and research through scholarly publication. The journal has a clinical focus and publishes material that will improve the evidence base for physiotherapy and assist physiotherapists in the management of their patients. Contemporary physiotherapy practice incorporates a diverse range of activity and the journal aims to support physiotherapists, and publish material, from all areas of practice, be that the clinical setting, education, research or management. Physiotherapy Practice and Research welcomes submissions in the form of original research papers, critical reviews (systematic or state-of-the-art papers), case studies, editorials, expert commentaries and book reviews. Letters to the editor are also welcome. The journal will commission focused or clinical reviews in areas of interest; those planning such reviews should contact the editor in the first instance. It also aims to foster research capacity within the profession and as such supports and encourages submission from new researchers. Physiotherapy Practice and Research is a member of and subscribes to the principles of COPE, the Committee on Publication Ethics. Please visit the journal’s online submission system. Authors must suggest three suitable reviewers for their submission. Suggested reviewers must not have co-authored a publication in the last four years or have an active collaboration with submitting authors. You may suggest up to 6 reviewers. Please note that the editor retains the right to decide whether or not suggested reviewers are used.